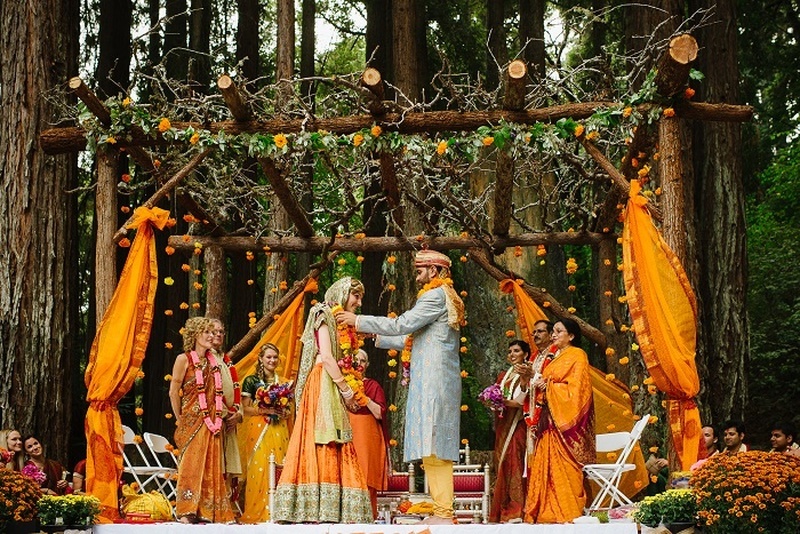 5 Unconventional Wedding Mandaps That Wowed Us! Wedding mandaps still remain the primary focus of your main day when it comes to the wedidng decor. While lavish and opulent mandaps with exotic flowers are frequently chosen for the holy spot, some venture into unconventional paths and ditch the traditional for the stylish! From minimal accessories to bold colours - couples are experimenting like never before when it comes to wedding decor! And we couldn't be happier! We have chosen five such unconventional mandaps that impressed us and are sure to inspire you to reach for the skies! Take a look! Minimal design, minimal flowers, white colour - everything baout this mandap makes it perfect for the beach- backdrop! Cushions, pastel colours and drapes adorn the grey mandap that couldn't fit more beautifully into the green backdrop! All white mandap with pops of yellow and a view overlooking the city - we couldn't love this mandap any more! Who knew black and white could also be used for stylish mandaps? If you are the classy couple, this one is for you! Rustic, minimal and pops of colour - this wedding mandap brings together the best of contemporary and traditional and is surely one of the best that we have seen!